Well now you can find out exactly what happened when the boys in black and white played on 6th January. 3 years ago on 6 January 2013 – The Swans grabbed a late equaliser to draw 2-2 with Arsenal in the FA Cup 3rd Round in front of a Liberty Stadium crowd of 18,848. Michael Laudrup’s side took the lead with a second half goal from substitute Michu, but two goals in three minutes looked to have sealed the Gunners path into the Fourth Round before Danny Graham’s scored 3 minutes from time to force a replay. 9 years ago on 6 January 2007 – Premier League Sheffield United were victims of an FA Cup 3rd Round giant-killing as the League One Swans won 3 nil at Bramall Lane. Over 4,000 Jacks, who were in fine voice all afternoon, enjoyed a famous win thanks to two Tommy Butler goals and a penalty from Leon Britton. 12 years ago on 6 January 2004 – Top of the table Oxford United held the Swans to a goalless draw at the Vetch Field in front of a Nationwide Football League Division Three crowd of 8,896. Brian Flynn’s Swans maintained their position in the Play-Off places. 15 years ago on 6 January 2001 – The Swans laying in 21st place in Nationwide Football League Division Two under the guidance of John Hollins, lost 2 nil at 2nd placed Wigan Athletic with Jason ‘Smudger’ Smith being sent off to compound a horrible day in the north-west. 18 years ago on 6 January 1998 – Matthew Bound scored for the Swans as they lost 2-1 to Peterborough United at the Vetch Field in the Auto Windscreens Shield 2nd round – Southern Section, in front of a crowd of 1,179. 24 years ago on 6 January 1992 – Goals from Shaun Chapple, Andy Legg and John Williams helped the Swans run out 3-1 winners at Kidderminster Harriers in the Allbright Bitter Welsh Cup 4th Round. 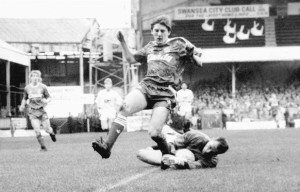 26 years ago on 6 January 1990 – A man of the match performance from Swans keeper Lee Bracey helped Ian Evan’s Third Division Swans hold their Division One opponents Liverpool to a goalless draw in this FA Cup 3rd Round game in front of a packed Vetch Field crowd of 16,098. 41 years ago on 6 January 1975 – Part timers Kidderminster Harriers held Harry Gregg’s Fourth Division Swans to a goalless draw in the Welsh Cup 4th Round. 43 years ago on 6 January 1973 – Wyndham Evans scored for the Swans as they were held to a 1-1 draw at the Vetch Field by Southend United in the Football League Third Division. A crowd of 2,466 watched the bottom of the table Swans playing their relegation rivals.